To Trade or Not to Trade: The Pittsburgh Penguins Have Been Juggling Goalie Talent as of Late and it Seems Like One of the Pens’ Stars Might Fall Victim to a Trade. With Extra Goalie Talent and an Expansion Draft Looming, Marc-Andre Fleury Might be the Latest Player to Wear a new Jersey Soon. There has been a lot of debate over whether or not the Penguins should part with goaltender Marc-Andre Fleury. Since Matt Murray showed the Pens what he could do and led the team to the Stanley Cup, Fleury has found his name subject to a lot of talk. Fleury is slowly becoming Pittsburgh’s second choice and with the expansion draft looming the Penguins need to make a choice. Before the Penguins can risk exposing one of their skilled goaltenders in the expansion draft, they need to see what kind of moves they can make. Fleury is currently under contract for another two seasons with a $5,750,00 million dollar cap hit and a modified no-trade clause. The Penguins might opt to move Fleury before they risk losing him for nothing during the expansion draft. If the Penguins decide to trade Fleury they’ll have to find a team in search of goaltending. Perhaps the St.Louis Blues, Dallas Stars, Arizona Coyotes or Colorado Avalanche will be looking to finally update their goalie talent. These four teams sit at the bottom of the league in terms of their goals-against average per team. St. Louis and Dallas are only a few wins away from the Western Division wild card, hence a boost in net would be a positive. St.Louis is looking to make a deal this trade deadline and are even shopping Kevin Shattenkirk again. The Stars might look to goaltending improvement if they think the move will help their playoff run. The Coyotes and the Avalanche aren’t looking for playoff contention, but they will be looking for good deals while the teams are selling. The Penguins’ roster is loaded with talent as it is but if they are looking to deal Fleury for return they’ll look to make something work. Even a solid young or established player with potential and a draft pick can make up for the possibility of losing the skilled goalie for nothing. The Penguins have reliable play in Murray and the rookie holds a lot of potential for the team’s future. Fleury is still a strong and solid goaltender and has been their longtime starter. This might make the Penguins feel like they want to keep the goalie. If the Penguins keep Fleury on the roster they will come to a very difficult situation come June. The expansion draft requires that all teams expose at least one goaltender and the rule that excludes rookies makes Fleury the only option. Sure, exposing the goaltender does not guarantee that the Vegas Golden Knights will pick him up, but the risk is pretty high. Depending on the other goaltending talent that goes exposed during the draft, Fleury runs a high risk of being drafted. In fact, Vegas would be somewhat foolish to overlook Fleury for another possibly inexperienced goaltender. If Fleury is picked up in expansion the Penguins will lose him for nothing and he will be off to Vegas. The risk of losing the goaltender is pretty high and the Penguins might not want to gamble with such odds. The risks are high and it is likely that Fleury will be a Golden Knight if left exposed. In the end, it comes down to one simple question: do the Penguins trade Fleury for even a decent return or risk losing the goaltender for nothing? The Penguins have until March 1 to make their decision and it won’t be an easy one. No team wants to have their back against the wall, especially when dealing with a former full-time starter who is still highly skilled. Therefore, the fact of the matter is that the Penguins need to make a decision. And it is better to trade the goalie now for something in return rather than lose him to Vegas. 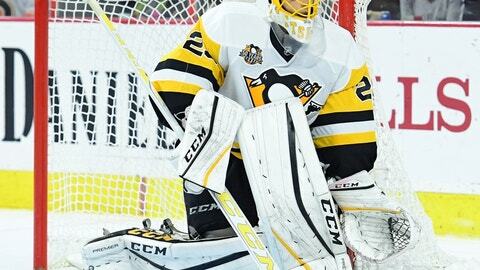 Pittsburgh has expressed the desire to work with Fleury as far as a possible trade is concerned. Working with Fleury concerning his trade is a good move because the Penguins will be able to benefit Fleury and themselves. It is a much better move to coordinate a good trade destination with Fleury. Therefore, Pittsburgh would get something in return and Fleury would have some control over his destination.